I'm so excited for this blog post because I've been wanting to do one for a very long time about my ALL-TIME FAVOURITE BURGER JOINT UME BURGER. The reason I'm so excited about this place because it really, really made me LOVE burgers. In fact, Ume Burgers accounts for at least 95% of all my burger calories to date! And as much as I hate to admit it... in actual fact I didn't really like burgers before! I mean, what's so great about a piece of meat in-between two bread buns? "If Ume Burger were a cult, I'd devote my entire life to it." The word "ume" is Japanese 梅 meaning "plum". In Japan, the plum blossom is thought to symbolize devotion. The devoted leader at the helm is Head Chef Kerby Craig — winner of six-consecutive Sydney Morning Herald Good Food Guide awards at Koi Restaurant. Kerby found the inspiration for his first venture Bar Ume, in the street counter-culture of Tokyo, and opened up a casual dining experience in Surry Hills for Japanese bar food, liquor, and burgers. His second venture, Ume Burger in Barangaroo is Kerby's latest love, specialising in burgers, soft serve and Japanese sodas, and it is clear his passion has definitely paid off. Whatever food you're into there's something for everyone at Ume Burger. There is the Fish Katsu Burger with Hand Crumbed Fish Fillet for the seafood lovers, the Menchi Burger with Handmade Pork if you can't go without Pork katsu, the Kakiage Burger with Vegetable Fritter and Nori Mayo if you're not that way inclined, the Classic Cheeseburger with Ume’s Special Sauce for the loyal cheeseburger lover at heart, but the signature burger is of course the Ume, with their Signature Beef Pattie (cooked to medium rare perfection), Wagyu Mince Sauce, Truss Tomato, Onion, Mayo & American Cheese - the supreme choice for the most supreme burger enthusiast. Holy flippin' burgers, so many beef patties! This was Miss Delightful's first visit to Ume, the single patty was enough to satisfy her - this time! Being his 20 millionth visit, Mr. Cardigan knew what he wanted before he even ordered it. ... and today I ate the Double Ume with Loaded Wagyu sauce. We also shared some Chicken Karaage and Hot Chips with Umami seasoning. There you have it. 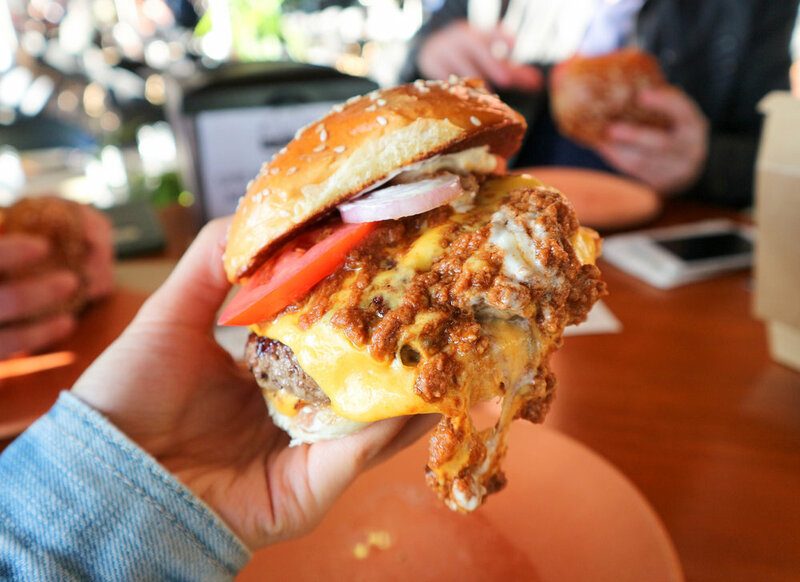 The next time you're around Barangaroo and looking for the perfect bite to satisfy that big craving, why don't you try an Ume Burger? The worst that could happen is that you fall in love with it and you never eat a different burger again! I'm back on Zomato now!